Oh, my friends, I have such a brilliant idea for creating simple, yet magnificent Christmas centerpieces today! I wondered as I was putting two of the easiest Centerpieces you will ever create, “Why didn’t I think of this earlier”?!!! And if you love fresh green in your home here is a way of making stunning arrangements without all the work and mess. 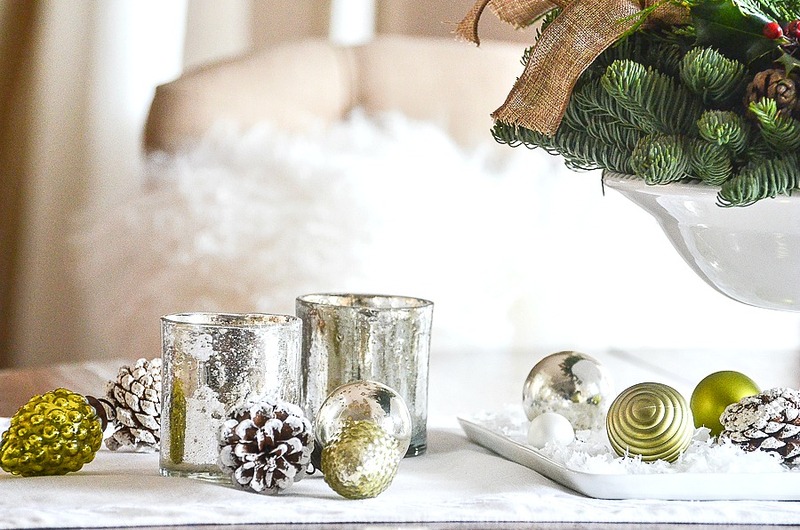 Let’s make these easiest Christmas Centerpieces! Please visit the beautiful blogs at the bottom of this page! 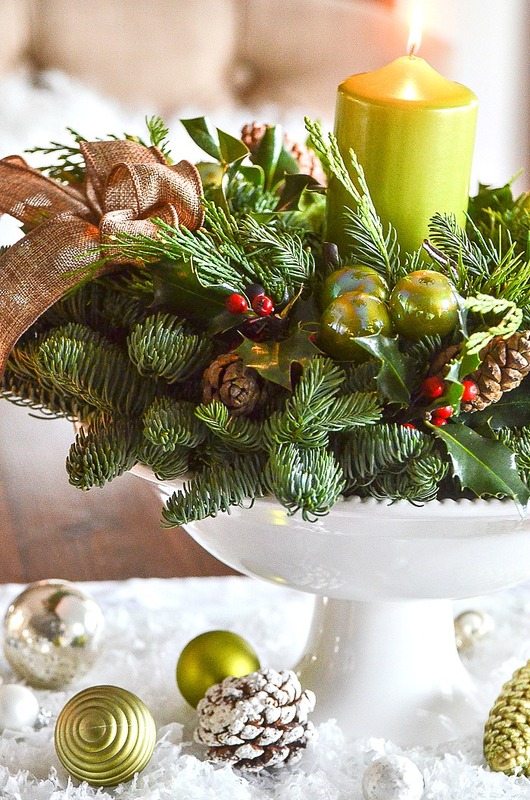 Their arrangements are breathtaking and they have lots of Christmas decorating ideas for you! 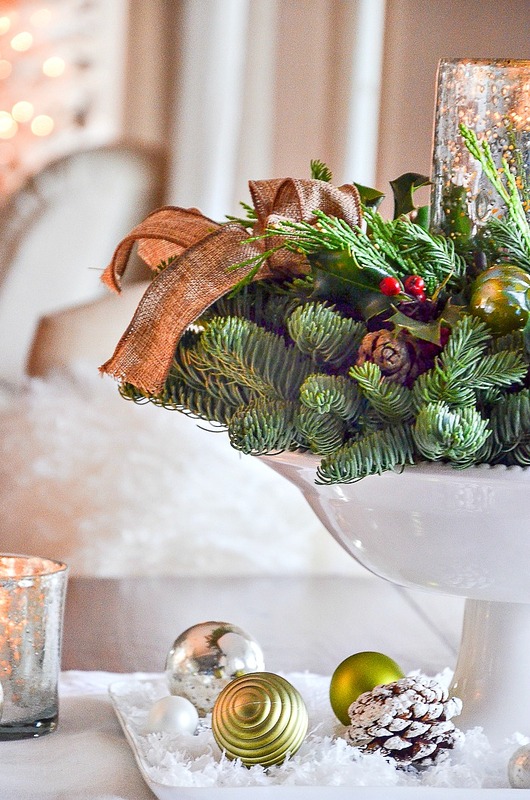 But first, let me show you how easy it is to make a Christmas centerpiece! 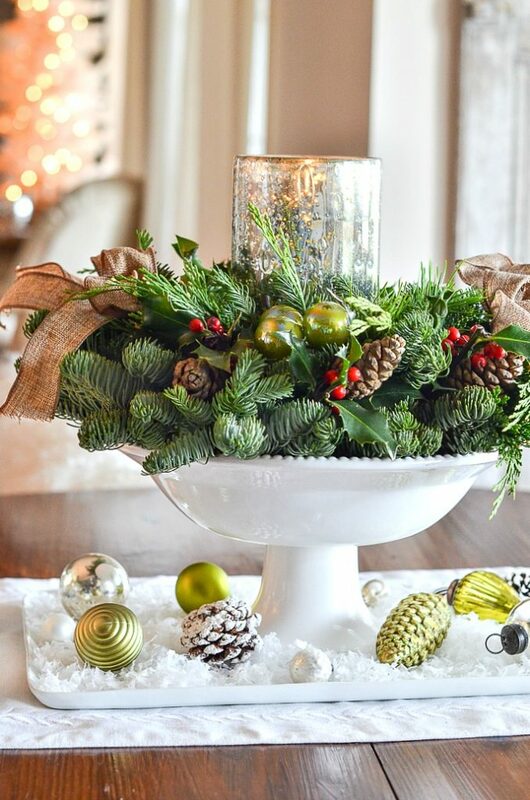 This pretty centerpiece was made with a pre-made live Christmas arrangement from Lynch Creek Farm! It came beautifully boxed and ready to be used! And just picked fresh! It even came with a shimmery lime green candle! Healthy greens and such attractive embellishments! I was inspired to create a kitchen table centerpiece by the Limelight Centerpiece arrangement. It is all self-contained so it easily slipped into a white pedestal bowl I had. Easy-peasy right? And really very lovely too! Because I used small mercury glass votives across the kitchen table centerpiece I put the lime green candle into a taller mercury glass candleholder and put it into the center of the arrangement. Simple, right? A white linen runner with a border of embroidered white leaves was placed down the center of the kitchen table. It makes a nice base for this centerpiece! I wanted to give the arrangement a snowy look so I used a simple white tray to contain the faux snow! I love snow!!!! Lime green and citron ornaments mirror the Christmas balls in the centerpiece. And to round out the tray I used white snowy pinecones and mercury glass silver balls as well as pearly little round ornaments scattered here and there. To each side of the snowy arrangement, I added a couple mercury glass votives and more coordinating ornaments and pinecones. This Christmas centerpiece took less than 10 minutes to put together! And it will look beautiful all Christmas season! You can create this too! 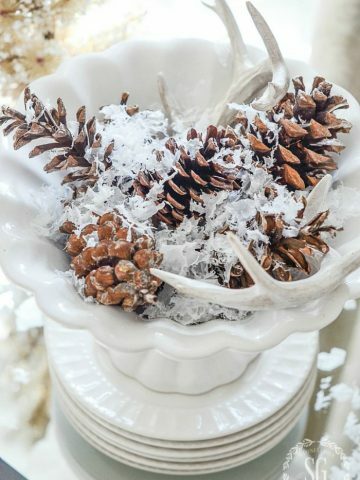 Just choose your favorite centerpiece from Lynch Creek Farm, find a pretty container to put it in (if it does not come with a container) and add a few embellishments to your table that work together! Done and done! Really, isn’t this a brilliant idea for easy Christmas decorating? 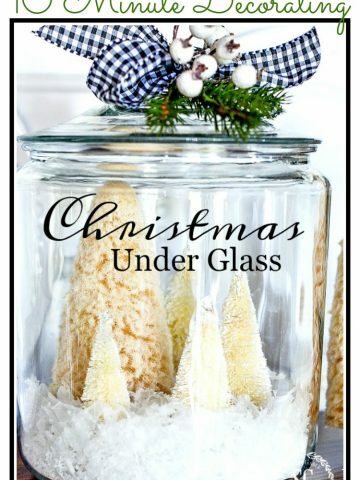 Think of this post as a “formula or recipe” to make the perfect Christmas centerpiece! Now let’s use a wreath in another easy Christmas centerpiece. I recently purchased a round coffee table and was at a quandary about decorating it for Christmas. That was until I got a beautiful live wreath from Lynch Creek Farm. It’s called the Majestic Magnolia Wreath. It’s 26″ and it is a show stopper! The beautiful live wreath became the arrangement! I just added a candleholder holding snow and a chunky candle. That’s it! The WOW Factor wreath became a WOW Factor centerpiece! Easy-peasy! YES, JUST THAT EASY!!!!! The wreath came with this gorgeous shiny, ribbed bow. It works so wonderfully with the magnolia leaves! Sigh! The embellishments are sturdily affixed to the wreath and are very generous in size! A beautiful wreath would make an amazing centerpiece on the same things in your home as the kitchen centerpiece above! 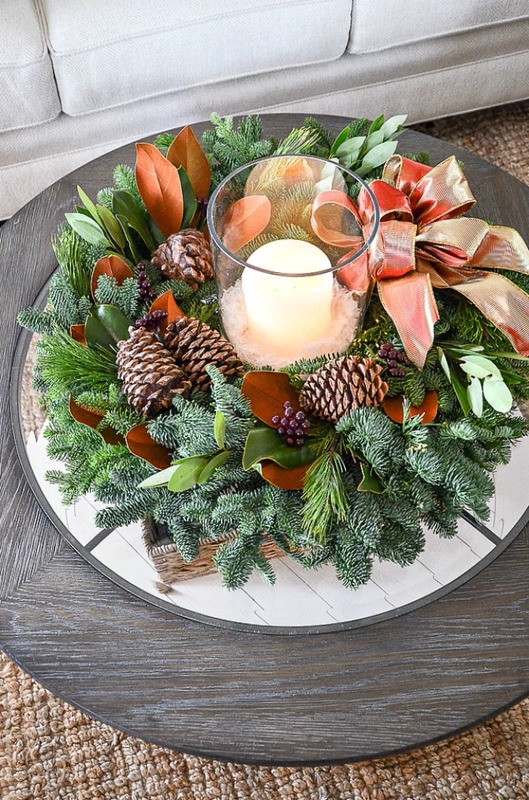 Like the kitchen table arrangement, the coffee table arrangement is an easy formula to follow and put your own spin on for Christmas decorating this year! Wouldn’t you love this Majestic Magnolia Wreath? The kind folks at Lynch Creek Farms are giving one lucky StoneGable reader a wreath just like it!!!!! It’s easy to enter. Just leave a comment below! That’s it! Just like the Christmas centerpieces EASY-PEASY!!!!! The giveaway is a quick one and will end on Saturday, December 8th at midnight est. The winner will be contacted by email. Good luck! Now, how about visiting my Monday Morning Bloom friends and entering to win the wreaths they are featuring too! But first, enter for the wreath here at StoneGable! A big THANK YOU to the kind folks at Lynch Creek Farm for the gorgeous Christmas “blooms” I love how fresh and beautifully boxed your product came to StoneGable and how stunning they look in my home! All the opinions are 100% my own! Those live wreaths are wonderful ! 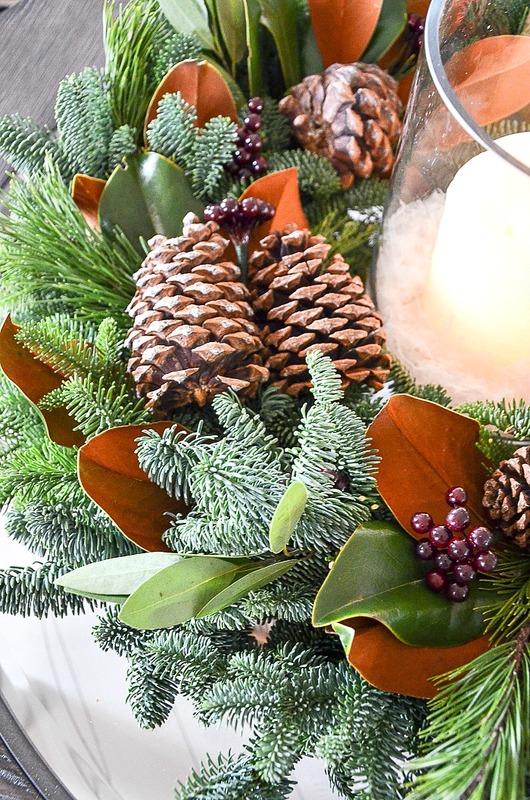 When I need a long-lasting centerpiece , I use an artificial wreath in the same way , tucking in some live sprigs that I can replace as they wilt . I love your wreath centerpiece!!! It is gorgeous!!! I love how you put it together on your round coffee table. Your decorating always looks so pretty and you make decorating so easy with your wreath/centerpiece idea, thanks for sharing. 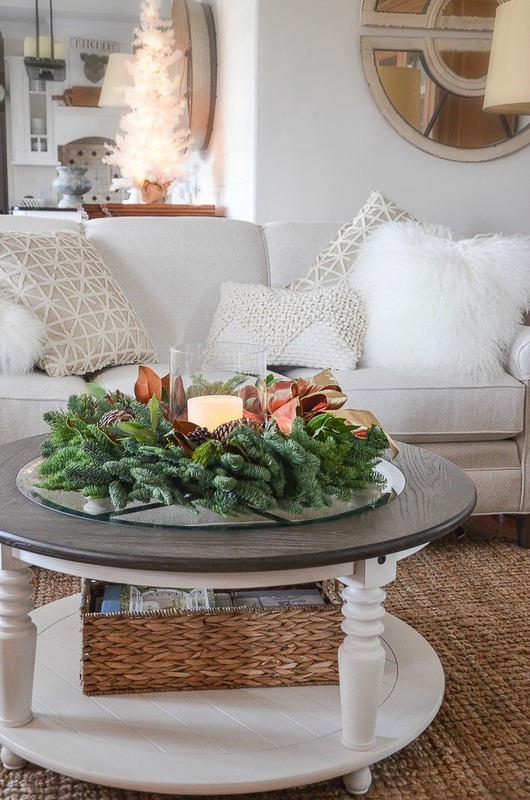 Love the wreath and the coffee table decoration. Love the easy centerpiece ideas. They’re beautiful and natural which I love. Living in Michigan we have no magnolias so the wreath would be a wonderful addition to my Christmas decorating. Thanks Yvonne for all your beautiful inspiration. the decorations reminds me of childhood christmas. The wreath is absolutely gorgeous of old fashion Christmas. This Christmas wreath is just gorgeous and I am sure smells delicious! What a beautiful wreath. And how clever of you to give us a “recipe” for making a centerpiece. Your decorations are lovely. I’ve used wreaths with candles as centerpieces for years…they are so easy, yet make a beautiful statement. These wreaths are breathtaking! Thank you for sharing! I absolutely Love to get your Emails to see what you have next to Make or Cook. The is Gorgeous, would be an Honor to have it hanging on my door. Thank you so much! Beautiful wreaths! Love the spin you put on them for decorating inside the house! Thank you! As always, such a beautiful, easy way to decorate at a hectic time of year. I visited the Lynch Creek Farm site and was pleasantly surprised at the variety of wreaths, centerpieces, etc. that they have. And the fact that the prices were very reasonable. 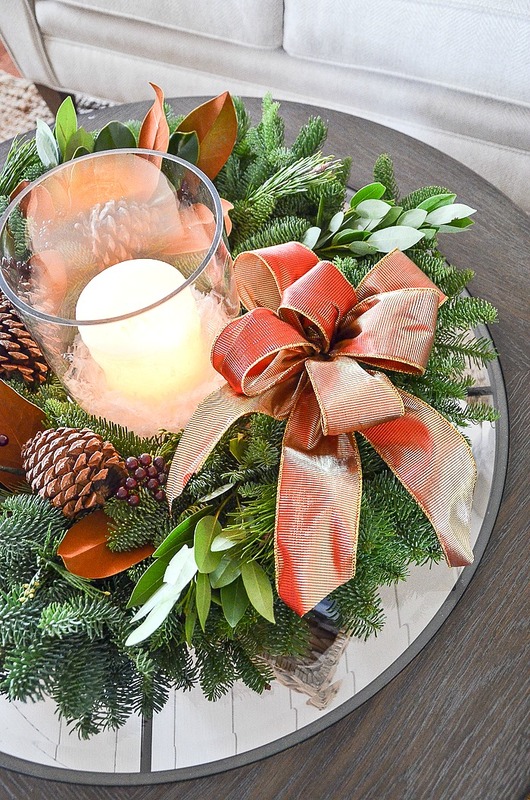 Loved the idea of just adding a candle to the center of the wreath for your coffee table. Thanks for yet more beautiful ideas. I absolutely love decorating with magnolias at Christmas! Your wreath is elegant simplicity. I am 70 years old , and I remember my mother using magnolia leaves every year to make our house festive. She would often spray paint the leaves gold and silver. Sweet memories. The wreath and greens are beautiful! I especially love the addition of the green shimmering candle ! Love your centerpieces…I have used a wreath for a centerpiece many times..and would love the beautiful giveaway wreath…GOOD LUCK TO ALL!! Such a beautiful wreath! Very elegant and perfect for my South Carolina Christmas decorations! These decorations are beautiful and inspiring! I absolutely love this post with the wonderful ideas for centerpieces! Your blog is so helpful & I look forward to all your postings! I woulda love a fresh wreath to place on my fireplace mantel decorated in woodland animals and winter garland. Enjoyed soaking in all the beauty in your photos. Thank you for showing all of your beautiful ideas. the reason for the season. Thanks so much! Ove the gorgeous wreath on your coffee table, Yvonne. Stunning! Love love this wreaths and I like it better on your roundtable and the way you set it up. I like to use snow too. Thank you and love your blog. Lynch Creek Farm sells wreaths at our local farmers market in Olympia. We send their gorgeous fragrant wreaths to our family every year! Their wreaths are fluffy, full, and fragrant. They last through the holidays and are still beautiful when we finally decide to take them down. Love the magnolia leaves and shiny bow on this wreath. Great find! Gorgeous wreath! Thank you for your wonderful ideas! Gorgeous! Great ideas thank you! Love, love, love your beautiful home! Thank you for inviting us in and then sharing with us how we can achieve a similar look in our own home! Great idea to use a wreath in this way…I never would have thought to do this! You are an inspiration! I look forward to everyone of your posts. Creating beauty and sharing your sincere faith. I’ve always struggled using magnolia because I wanted only the shiny side of the leaves to show. That wreath changed my tune. Even the brown back sides are lovely. Lovely give away, Yvonne! Lynch Creek Farms has THE MOST gorgeous wreaths, centerpieces, trees, etc.. I’ve been ordering them for myself and as gifts for years. They are always a big hit. You can tell when people really, really like the gift you send and Lynch Creek wreaths are always a favorite with my friends, family, and business clients. Beautiful as always! Merry Christmas. Beautiful! Love the wreaths and the way you’ve uused them! Both the wreath and the centerpiece are gorgeous . I have really enjoyed following your blog! Merry Christmas and good tidings to all!! Love ❤️ your decorating style! And would love to win the wreath giveaway! Merry Christmas!!? The wreath reminds me so much of my mother she loved to decorate her holiday wreath and always made the holidays so special for her family. I miss her and would love to win this as a reminder and tribute to a wonderful mother. Your posts this month have been an incredible help to me. We are in a new house this Christmas. I had downsized a lot so these new ideas were just the things for me. Thank you for being such a blessing this holiday season. Oh, my! This is lovely! I have never posted a comment before, even though I do enjoy reading them…that’s how beautiful these wreaths are! As a southern girl , you have me at magnolia! your always an inspiration! your home is lovely and even more so at the holidays! What a lovely centerpiece for Christmas! Who wouldn’t love to have one! So very beautiful! I’d love them on all my doors! This wreath is gorgeous! My children and grandchildren (and one little great!) will all be here for Christmas (about 27 of us now in all), and I would love to see this spectacular wreath on our dining room table when they get here! Thanks for all your wonderful inspiration! Hi Yvonne, I LOVE this wreath. Love the lime green and the magnolia leaves, beautiful greenery. It would look gorgeous on my table!! Thank you for the daily inspiration and the opportunity to win this beautiful wreath. Merry Christmas to you and your family! All your ideas are so inspirational and gorgeous! As always – just gorgeous! Love your blog!! Simply gorgeous! I am never disappointed! Your talents never cease to amaze me! And that wreath! Ahhhhh! 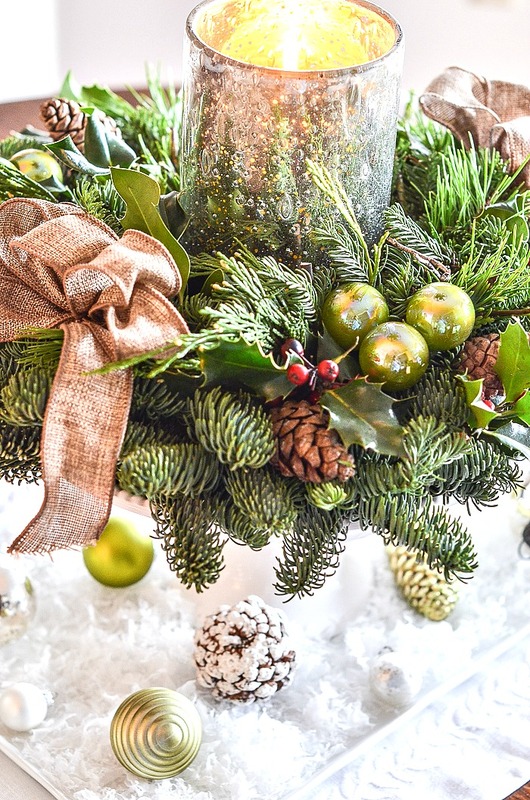 These are stunning… Nothing replaces the natural beauty of live greens at Christmas! And I can only imagine the smell is intoxicating and holds nothing to even the best of candles!! So lovely and graceful. I always have centerpieces made of wreaths in my home for the holidays as they are so easy to decorate and display. Thank you Yvonne for the inspiration and the giveaway! This wreath is gorgeous and the magnolia makes me think of my late Mother who was born and raised in the South. I need your tips more than ever this year. A leaky dishwasher damaged our kitchen floor so we are in the middle of an unplanned DYI kitchen update. I’ve not even started to decorate for Christmas! YIKES!! Thank you for all the ideas of hosting multiple Christmas meals. I too will be hosting a brunch and dinner. This will help my day go smoothly so I can enjoy the day! Love, love the magnolia wreath! this wreath is so beautiful, and being a Southern gal you had me at magnolia! 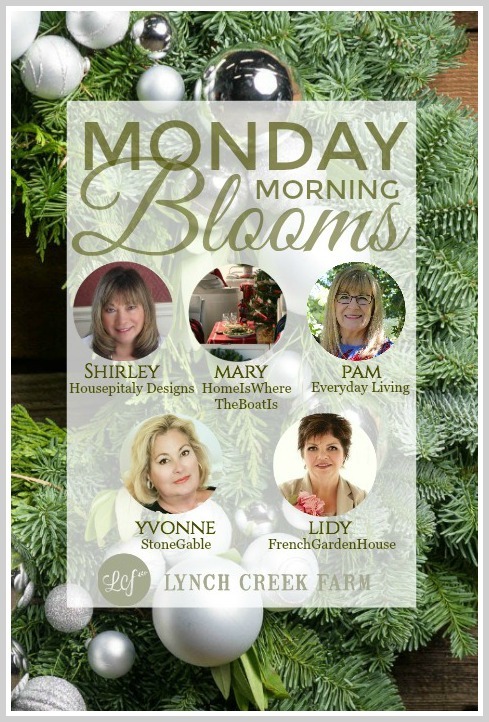 I have only learned of Lynch Creek Farm from reading the Monday Morning Blooms, and they have so many wonderful things and so reasonably priced! Its fun to see how everyone is using these fabulous giveaway wreaths and centerpieces, thanks Yvonne! I look forward to your blog each day. You are a fabulous designer!! Lynch Creek Farms wreaths are so beautiful. This Magnolia wreath is stunning!! Thank you so much for posting these beautiful centerpieces. I am from Massachusetts and 20 years in DC, but have been in CA for 30 years ( dang. Getting old here!) I really miss all the New England greenery, the smells, tastes and the snow. Nothing here can match the smell of icicles hanging from an eave on a wintery day. i would love to win the beautiful wreath as i have the entire family coming (16) , and am beside myself happy. Our 3d is 29 and autistic, and she LIVES for Christmas. She is our precious and perfect-in His -image gift from God, and we adore her, but life gets complicated. Boy, would a wreath be a help. Love you, love your devos. All of it. You are a treasure, Yvonne. That wreath is absolutely beautiful in it’s simplicity! Would look fantastic in anyone’s home for the holidays, but especially mine! 😉 Thank you so much for a wonderful giveaway! Happy Holidays to you and your family! As always, your posts bring joy to my day! These ideas for simple arrangements are inspiring. Such lovely wreaths! I have the PERFECT spot for this gorgeous wreath! This beautiful wreath would be a welcome addition to my home this Christmas. Merry Christmas to you and your family. May God bless your time together. I love the wreath and and how easy you make decorating! I’ve enjoyed your blog for years. Happy Holidays, Yvonne! This wreath is so beautiful I love the addition of the pine cones and the choice of ribbon color. It would make a stunning centerpiece of any front door. I also like to use a wreath to surround my punch bowl. I love the Majestic Magnolia Wreath. It is just gorgeous and is the perfect compliment to my Christmas decor. Thank you so much for the giveaway. I love looking at all your Christmas decorating ideas. You have inspired me in so many ways throughout the year and for the holidays! I would LOVE any of these gorgeous wreaths! Lovely! Thanks for this reminder! I stumbled on this myself a couple years ago when a last minute wreath was given to me. So easy and just beautiful. This recaptcha thing is pretty time consuming Yvonne. LOVE LOVE LOVE!!!! LORD LET ME WIN THIS GORGEOUS WREATH. :). Christmas wreaths are one of my favorite decorations. Beautiful. Merry Christmas! Love your Christmas look. Bleached pinecones are in the oven now. I love that you turned this beautiful wreath into a centerpiece! This wreath would be so awesome to win. Thank you for the opportunity. Oh, how you always solve my decorating problems…I have those lime green candles and have wanted to use them in my Christmas decor…thank you for your inspiration, and I sure hope I win the wreath to get that exact look!!!!! Love the centerpiece ideas. Please share with us the fun games you have planned for your family . I’m in love with the wreath on the door! The color of the bow, along with the Magnolia leaves, makes this an outstanding holiday wreath! I have a round coffee table to and love your arrangement. Thank you! The greenery is so beautiful. I would not have thought to use lime green as a Christmas color but it is so pretty. I love your “recipe” ideas for using the wreath. Simple & easy but stunning! I love the beautiful centerpieces you created…..especially the one in the white pedestal bowl!! Thank you for the giveaway opportunity! 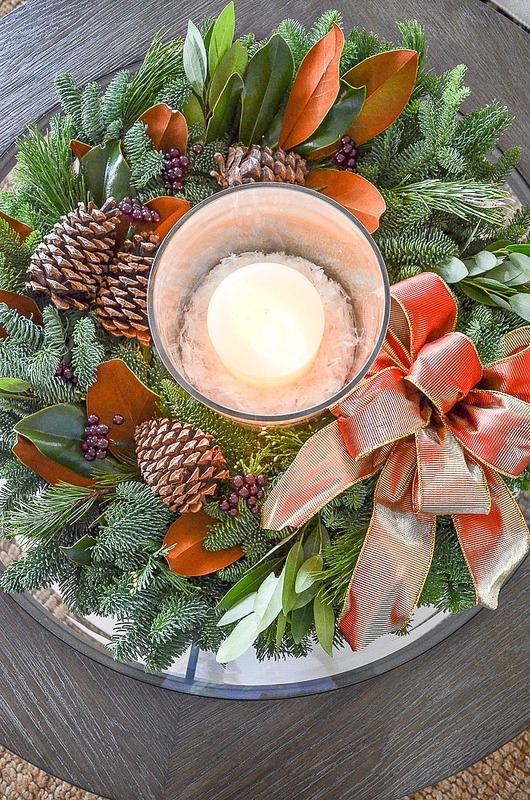 Lynch Creek Farms’ Wreaths and Arrangements are stunning and so versatile since they fit all home decors! I would love to win one of their gorgeous Wreaths since I live on Disability income and cannot afford to buy any Christmas decorations. Thank you for offering their giveaway Yvonne! Merry Christmas from Ohio! Marginalize not what I wrote, should be magnolia. Love the arrangements and living in the south I just love marginalize , the waxy , shiny green and the purest white of the mongolia itself . As always love your blog. I love the greenery used in these beautiful creations! 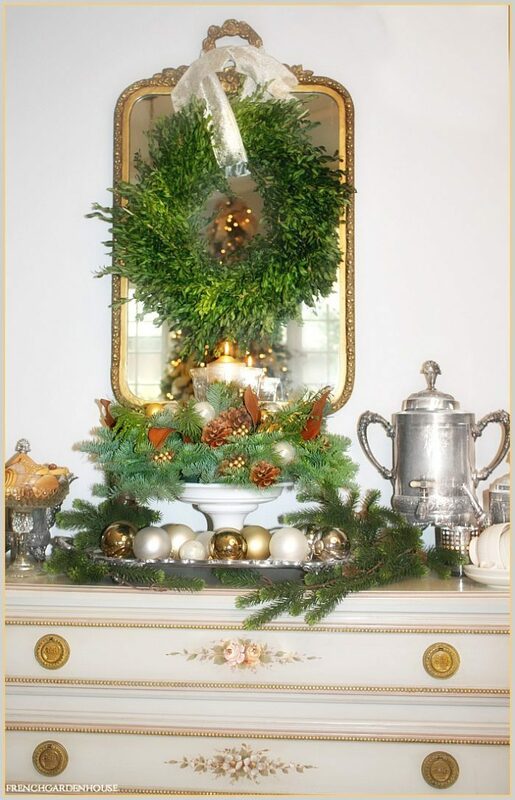 Yvonne, I love the use of a wreath on a table or sideboard. You are right so easy peasy decorating. I love to make mixed green wreaths at Christmas time and give them as gifts for the holiday season. Have a great Friday. These arrangements are beautiful. Thank you for always finding ways to create beautiful decor for our homes. Thank you for offering the wrea Th in a giveaway. I love your decorating and have copied so many of your ideas. I don’t miss a post from you because it is such useful and helpful information. Thank you for the opportunity to win. I really enjoy reading your blog each day. You inspire me to try new things in my home and make it look so easy. Thank you! The Magnolia wreath is absolutely magnificent! love, and the very Presence of Christmas the Lord! Your round coffee table looks perfect! I especially like the lime green touches. The magnolia wreath is lovely! It makes a beautiful centerpiece. Wow! A lovely wreath. Magnolia is a favorite scent. We had a magnolia tree for over thirty years. The wreaths look fresh and well made. Would love to see one in my home. Thanks! That is a gorgeous wreath!! I miss you on DTT, Yvonne… but know that your decision is definitely the right one for yourself and your family for now. I do hope that you will have time to make a guest appearance on DTT every now and then. Merry Christmas! Thanks for all the holiday inspiration, Yvonne. Blessings to you at this holy season. Beautiful wreath. Would love the opportunity to win it! Thanks! Beautiful, elegant and easy. Would look lovely on my round coffee table. This arrangement is simple, elegant and beautiful. I would love to have one on my round coffee table. Love the idea of using the wreath as a centerpiece! What a wonderful idea!! Love it. The wreath is stunning and thank you for sharing what you did. I love the beautiful wreath, especially because of the magnolia leaves in it! We moved from Kentucky several years ago, and oh do I miss having fresh magnolia to decorate with!! Your gorgeous decorating ideas and recipes, devotionals, etc. really inspire me!!! That is a beautiful wreath. Thank you so much for the opportunity to win one. Love the magnolia wreath as a centerpiece and adding the extra touches really makes it more elegant. Same goes for the arrangement in the lovely white bowl. Clara ? Your home is so gorgeous and I love the idea of the wreath centerpiece. Thank you for sharing your decorating ideas with us! Just stunning! 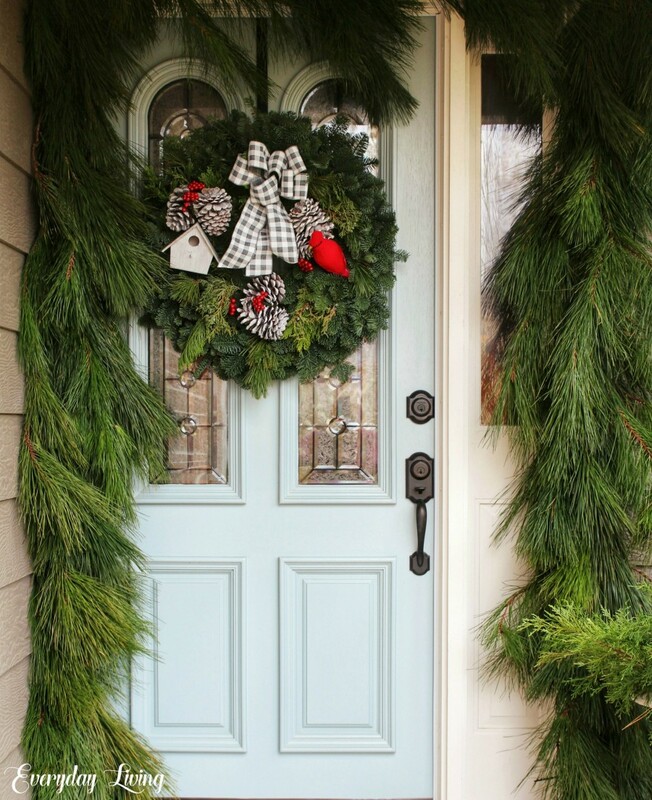 I love the simple elegance that the fresh greens add to your beautiful home, and the magnolia wreath is gorgeous. There’s nothing like the real thing when it comes to Christmas greens. Yvonne, I have loved your beautiful home since I first started reading your blog. Love the bright interior, and at Christmas it just sparkles. Thank you for sharing your Christmas decorating with us! Love the wreath centerpiece. I did this with a fake eucalyptus wreath and a glass hurricane, dropped in some cranberries and white candle .? The magnolia wreath contains the perfect combination of items and colors for my house this season. Yvonne, your new table looks lovely with the wreath centerpiece! I will have to try out that idea on my round coffee table. Thanks for the inspiration! 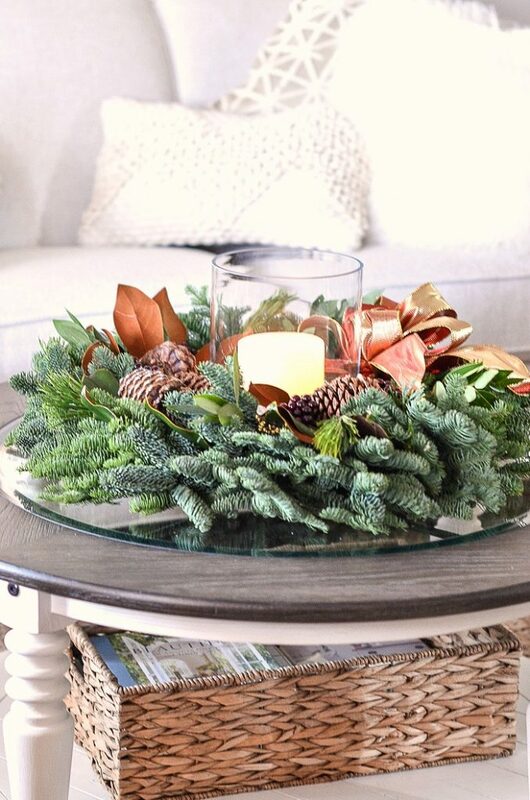 Love the idea of using a wreath on a coffee table, so I really need to win! Centerpiece for kitchen table is beautiful. I liked your use of the white pedestal bowl to place your wreath in. What a fantastic idea! I can count on you to always give inspiration! 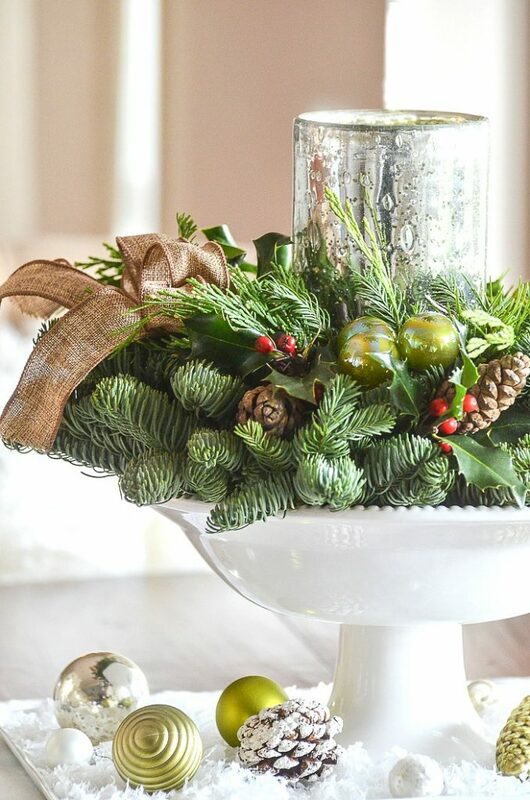 Love the idea of using the wreath as a table arrangement! Always so many great ideas here on your blog!! That is one beautiful wreath! You have surely made decorating easy-peasy. Absolutely gorgeous! I love the beautiful greenery! These are gorgeous and I agree, easy to put together. Exactly what I need! Thank you for the lovely idea! Merry Christmas! What a lovely and easy holiday centerpiece for your round coffee table. I have a round leather tufted ottoman that a wreath centerpiece would make a stunning display. I love the formula you provided for centerpieces. That makes my life easier. I always learn from you. Thank you. Lovely arrangements and the fresh greens add a special touch. What beautiful wreaths! So happy you share your wonderful decorating talent with us! Lovely centerpieces! Adorable and this will be a weekend project. Need to find some faux snow, loved it! I was just wondering where to store my footed bowl for the holidays. This will be a much better use. Festive and Fragrant. Lovely wreath and beautiful ideas Yvonne … Merry Christmas! 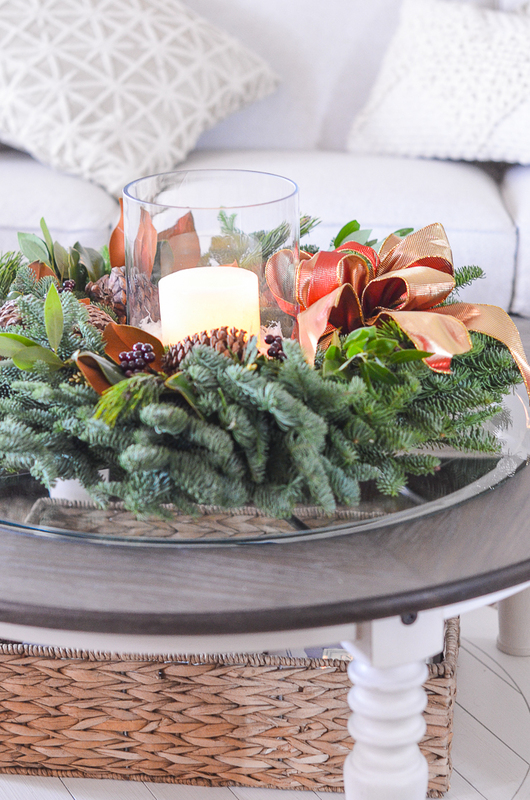 I love using a large wreath on my round living room cocktail table! I’ve put everything from multiple crystal candlesticks to a tall Nativity in the center. Sadly, this year I haven’t gotten a wreath. I would LOVE to win this beauty, though! So very pretty. And I love the simplicity of them both. I prefer understated holiday decorations and these are just that. These are such lovely ideas ! Wow, such easy centerpieces, with so much ‘pop’! Love this, Yvonne! Thanks for the simple tips, too! Hugs! Will you be joining Monday Morning Blooms on a regular basis now? I thought I posted but can’t find my post. Please forgive my double entry if it’s on there: I’ve been coming to your blog for a couple of months now, and I love it. I also started from the beginning on your podcast and recently listened to the latest one on Christmas tree decor from Anita and Kelly and saw that you have left. I’ll miss you (though I have over 200 left to listen to in which you are still participating). Have fun with your family. Love the wreath too! I have gotten so many wonderful ideas from reading your beautiful blog! You are so creative I wish I lived next Door! I love your blog and the podcast, which I saw you recently left! I started from the beginning but listened to Anita and Kelly’s last podcast on Christmas trees and saw that you recently left. So sad. You were so fun. I hope you enjoy your time with your family. Oh, and yes, I’d love to win the beautiful wreath. Lovely wreath, I just love the fresh greenery. You had me at EASY! These are lovely. Enjoy the blog very much. Keep up the inspiration! Beautiful wreath and I love your ideas for decorating with it! Everything’s so beautiful. Thanks for the lovely giveaway. Merry Christmas. Yvonne, we are so blessed to have all this beauty in our lives. thanks for sharing your visions. Thank you for your lovely ideas and pictures. I look forward to them and am always inspired! How lovely! It is so cheerful with the lime green candle. If it isn’t easy-peasy it doesn’t get done at my house because I am all thumbs but with gorgeous wreaths like these even I can do it. I need to get busy! Thanks for the great ideas. This Lynch Creek Farm wreath looks so gorgeous and fresh! I love your ideas for using them in other ways than as a traditional wreath. 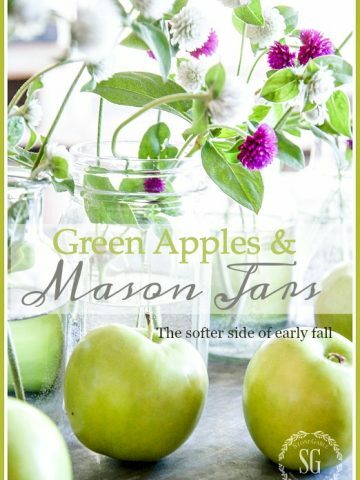 You are always so creative in your decorating thus creating one of my favorite blogs. I, too, love to decorate with fresh greens. I have cedar, blue spruce, and pine collected and ready to put into centerpieces. These evergreens are SO lovely! Hope to win!!! This beautiful wreath and arrangement are exactly my style! I prefer simple yet beautiful, especially for Christmas. Helps me focus on what the true meaning of the season is. Thank you for sharing your beautiful ideas. I would absolutely love to win that beautiful wreath! I am still using all my old Christmas things from many years ago and it would be wonderful to have something fresh and new. I love Lynch Creek Farms! Just delivered one of their beautiful fresh wreaths to a dear friend, who loved it. Would love to have this one? Thanks for all the wonderful decorating ideas. The wreath is especially gorgeous. Thanks for the reminder to use the beautiful magnolia leaves in my decor! My neighbor has a large tree and is very generous. Merry Christmas to you! Always love your posts and I love to visit Lancaster too! FRESH LIVE WREATHS ARE THE BOMB! What a gorgeous way to welcome and say the holidays are in your home. So pretty. It was fun to look over the selection of live greenery. So fresh that I could smell them! These are so beautiful…..love the magnolia leave in them….they would coordinate with our trees along our driveway! If I don’t win, I will just go pick some of my own! That is one gorgeous wreath! It looks perfect with a candle and makes a great centerpiece! I love Lynchcreek! Ordered a centerpiece for my parents! Love all you do Yvonne!Ive never seen a bad post. Most of all I love how you give Glory and praise to Jesus; the reason for the season. Christmas blessings to you ,yours and all your readers. ?❄️☃️??? The fresh greenery with the added natural elements is stunning! I love the lime green accessories along with the snow sprinkled on crisp white linens! Just gorgeous! The wreath is lovely! You cannot have Christmas in the “South”, without decorating with magnolia leaves. I think it might just be un-American…Enjoyed this post! What a great idea!! I never thought to use wreaths that way. And so easy! The fresh greenery with the added natural elements are just stunning! I love the touch of the lime green accessories against the background of the fresh white linens! Just gorgeous! Beautiful arrangement!! I came across your blog online and it’s lovely!! Beautiful. Love the use of fresh greenery. The snow just adds a fun element. Thanks for the ideas. Happy Holidays. I love all your wonderful ideas! Easy is best with so much to do at Christmas! Gorgeous live arrangements! These Lynch Creek Farms arrangements are gorgeous! I love the smell of fresh Christmas greenery. It brings back so many wonderful memories from my childhood. What a great idea for gifts for the neighbors! Oh how we, and especially I, miss my magnolia tree! I went out just this week and purchased some faux magnolia but it is just not the same. A magnolia grandiflora will be my next landscaping addition! Would love to have this wreath and be able to have some REAL magnolia in my Christmas decor this year. Thanks, Yvonne, for bringing Christmas cheer into our lives. I love the citron with mercury glass and snow. It’s so crisp and happy! I would love to win the gorgeous magnolia wreath–it would look spectacular over the archway in front of our home. Love the beautiful wreath and table! What a perfect spot to show off something beautiful. Stunning! Merry Christmas to you and yours. The magnolia wreath is absolutely stunning! I love to use fresh greenery in the house at Christmas, it makes the whole house smell like Christmas. Beautiful arrangements and so many ways to decorate with the live greens. Love the round look on the round table. Sweet! I can almost smell the freshness! Thanks for the great ideas. Love the wreath. Would look gorgeous on my coffee table too! Beautiful centerpiece!!!!!. The wreaths looks so fresh and full. I bet they smell good too. I’ll have to check out Lynch Creek Farms. As always, you are simply THE Best!!! . Thanks again for sharing your home ideas with us. I love your posts! You and your linked bloggers have wonderful ideas! Have you done a bow-making tutorial? I hope you will do an “after Christmas. but still winter” post. My house always feels bare after the Christmas decorations come down. Absolutely love using fresh greenery and this centerpiece idea is beautiful! Thx for the stunning yet Simple Ideas Yvonne!! I love your new coffee table. I have been looking for a round coffee table with a dark wood top but have had difficufinding one small enough. Need one around 30” round. Do you know by chance where you purchased yours. Thx always for your fabulous ideas an I hoe this holiday is extra special with your grandchildren and your foot has healed. Once again you demonstrate how easily and beautifully a lovely home can be created. Thank you so much, Yvonne! Wow – love these ideas! The footed bowl with greens is perfect! Love the wreath. Thanks for sharing. Thank you for sharing all your wonderful ideas. The Lynch Creek Farm wreath is beautiful and I love the idea of using it as a centerpiece. I would love to send this beautiful wreath to my Mom as an early Christmas gift!! Beautiful wreath, love the simplicity. The Lynch Creek Farm greenery looks gorgeous. Yvonne, your beautiful arrangements showcase the beauty and versatility of a fresh wreath. We are hosting part our neighborhood Christmas party this year and I still need a fresh centerpiece for my table!! What a beautiful idea!! I am surrounded by woods, so I am fortunate enough to have access to my own greens. I love your ideas! I used alot of your suggestions for my fall decor and received many compliments. So beautiful! My favorite part of the holidays is the decor. The Lynch Creek Farm”Majestic Magnolia Wreath” is gorgeous! The arrangement speaks to me of simplicity, softness and thoughfulness. Always enjoys freshness and “glowings” at this special time of the year! I just love all of your decorating tips and love seeing how you incorporate them in your own home. 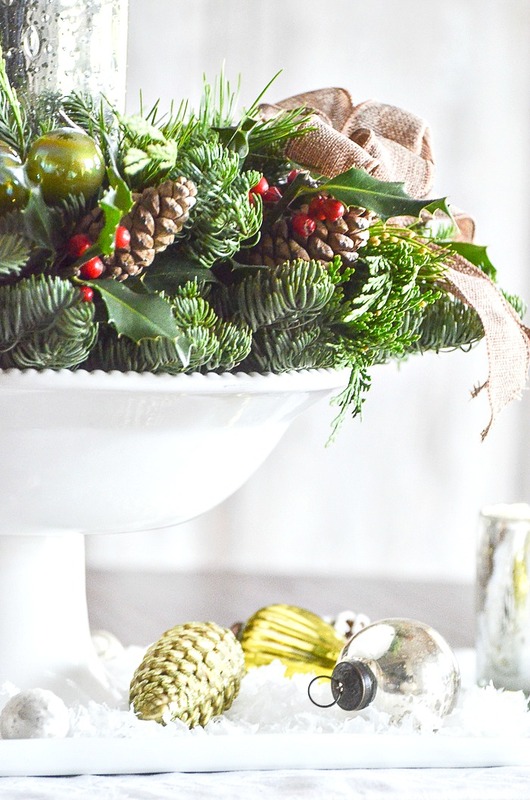 Nothing says Christmas like fresh cut greens made into a beautiful arrangements. Love it. The Lynch Creek Farms wreaths are absolutely gorgeous! Both arrangements you put together with them are so beautiful. Easy simplicity wins every time. All of these are so nice. I love fresh greens at this time of year. 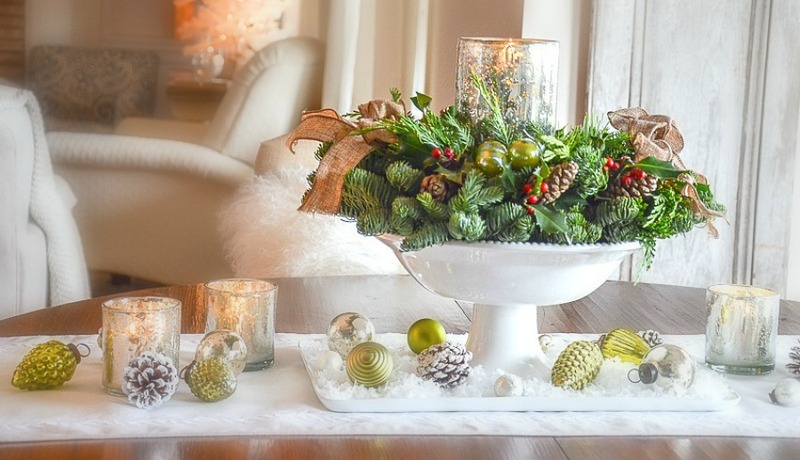 Love your centerpiece ideas – they look so festive and I really like how easy it is to put them together. I especially enjoy your enthusiasm, Yvonne – it always inspires and energizes me! Absolutely beautiful! Love coming to your page for decorating ideas!! The wreath and center piece are simply gorgeous. I love using wreaths for a centerpiece too. Living in the south, using magnolia leaves as part of the display just enhances its beauty. Thank you for sharing your ideas and taking part in this giveaway. What a beautiful wreath! I love the smell of fresh evergreens at Christmas! I love your simple, elegant style…the wreath is really fresh looking!! Love the wreaths Yvonne and have never had the opportunity to enjoy magnolia leaves in one. That is a beautiful wreath and makes such a pretty centerpiece! I would love to change up the same centerpiece I have used for years. My family would probably enjoy the change,too! Thank you. Love all your centerpieces! Thanks for sharing with us. Stress free decorating at its best! Thank you for sharing! So simple to use as a centerpiece yet so beautiful. Yvonne, your centerpieces are lovely! I believe I can even smell the crisp green scent of pine! There is nothing like fresh greens about the house to welcome in the CHRISTmas celebration! Blessings to you and yours as we celebrate the birth of our Savior and King! I love these easy centerpieces. I look forward to your ideas each day. The wreath is so beautiful! These are absolutely beautiful. Thanks for sharing! Everything you show us is beautiful. Thank you for your ideas. My mother has a birthday coming up, and I am going to make this arrangement for her. She’ll love it! Beautiful arrangements. I can almost imagine how amazing they smell! Beautiful and your little touches are perfect! Enjoying all the Christmas posts. The Lynch Creek Farm magnolia wreath is so pretty. Using the wreath as a centerpiece is a great idea, it is sure to receive lots of compliments. Easy peasy is just right for me! Thx! What a beautiful, easy idea! Love it as always Yvonne! I love everything you do! This wreath is beautiful! That IS a gorgeous wreath! And it would look lovely on my center island in the kitchen where I’d add more candles, similar to your arrangement with the Limelight Centerpiece. Thanks for the inspiration and the opportunity to learn about Lynch Creek. Love Lynchcreek Farms and their quality items. Send wreaths to the family from there every year. Thank you for another great idea to simplify the holidays. What beautiful arrangements! Using the wreath as a centerpiece is clever and looks so charming. Thanks for the giveaway offer! Love the centerpiece and the magnolia wreath. So beautiful! The wreath is lovely. The centerpiece is beautiful and I love the display. I bet it smells as wonderful as it looks! So Fresh! All of your ideas are always beautiful and this one is quick as well! love this idea and will definitely make centerpiece . Yvonne, I love these beautiful wreaths. I would love to have them in my home. Thank you for sharing all your ideas with us. Love the magnolia wreath, simple and beautiful! Love all your ideas! This new table is beautiful. May I ask were you purchased it at? Thank you so much for your post! I absolutely love your centerpieces! They are simple, classy and beautiful! I can’t wait to make one, using your formula! The wreath is gorgeous and I love the way you turned it into a centerpiece. It looks perfect on your new round coffee table. Thanks, Yvonne- I love all the wonderful Christmas decorations and arrangements that you show us! I love this idea. Simply beautiful! Thanks for letting us know about Lynch Creek Farm. Great new source. Beautiful! I LOVE the magnolia wreath. The colors are stunning. What beautiful and easy arrangements! I don’t know why I never thought of using a wreath on a table as a centerpiece. A candle in the center completes the look. Thank you for such a great idea and for the links to a fabulous resource for live wreaths and centerpieces. Everything is beautiful! I love your ideas! 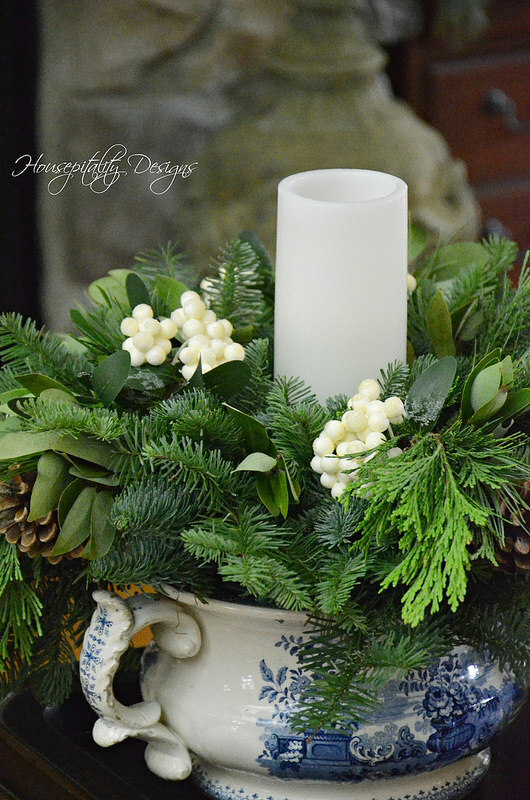 Yvonne, both of your tabletop arrangements are gorgeous, and so simple to make with the help of the Lynch Creek Farms’ wreath and centerpiece greenery. Thank you for the chance to win the beautiful wreath! 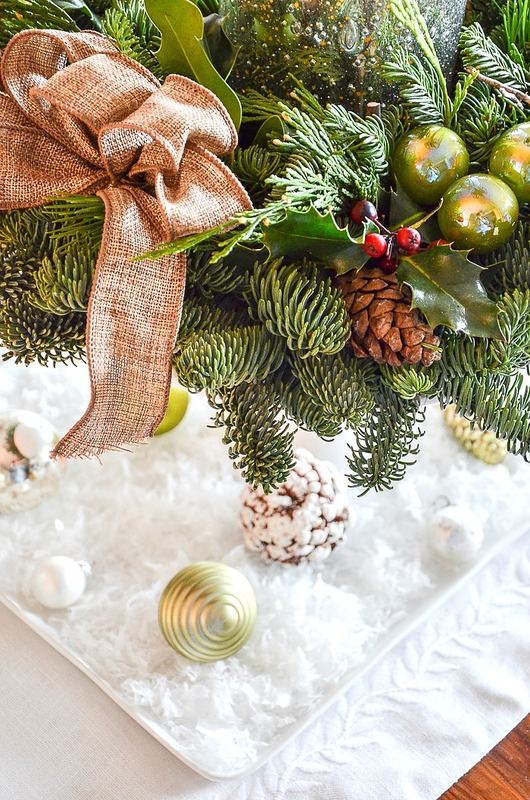 While many of us have opted for artificial trees these centerpieces would add that fresh Christmas smell we all love! Thank you for sharing. Again and again you post the most beautiful arrangement options. What an eye for beauty you possess! I love the idea of using a wreath as a table centerpiece! You always create the most beautiful arrangements and starting with a Lynch Farms live arrangement was a great idea. The magnolia wreath is gorgeous. Your blog posts are so inspiring. The wreath is so beautiful. Would love to in. Absolutely stunning. Love this idea. Beautiful centerpieces! Love your new coffee table! 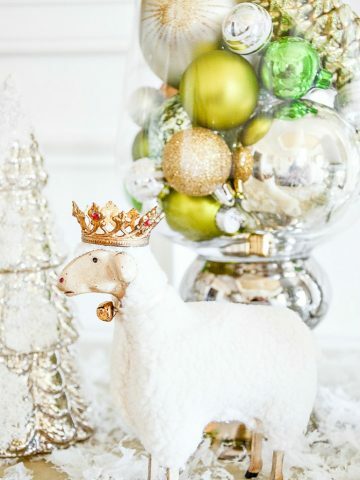 Thank you for sharing your Christmas decorating ideas out hear in blog land. Thank you for all the beautiful inspiration! That is a GORGEOUS wreath! Would love to win it! thanks for the Christmas fun and getting eye candy for breakfast…great way to start the day!! Love them! Thanks, too, for linking us up with a website we might not otherwise have known about! Great idea to use a wreath as a centerpiece. Lots of beautiful inspiration in this post! Stunning wreaths and so beautifully arranged in your home! As a former floral shop owner wreaths at Christmas time were one of my favorite things to make. The one you pictured is beautiful as well as the centerpiece. Thanks you for sharing your talents. Beautiful wreath! Great ideas all year long! Love your website!!!! What a great idea! Sometimes simple ideas are the best! I am totally going to use your wreath idea for my new round coffee table as well! There’s nothing I have put on it to decorate for Christmas that has looked just perfect … BUT I believe your idea of adding a wreath with a candle center will work just fine! I enjoy your blog and love that you bring your love for the Lord right into the middle of it every week!! Merry Christmas!! Festive, beautiful and easy! Just what I need this time of year!! Thanks Yvonne!! PS Still miss you on the podcast! Love these centerpieces using fresh greens from Lynch Creek Farm! And the best thing is they come from my home state of Washington in the beautiful Pacific Northwest! By far, one of the most beautiful wreaths I’ve seen. Thank you, Yvonne, for introducing us to this company. Merry Christmas blessings to all who gather at StoneGable! Those wreaths made lovely centerpieces and would be convenient for most people to do. Thank you for the idea. These wreaths are beautiful!! I hope that I am lucky to win one! Beautiful!! Such beautiful centerpieces and so easy! I’m inspired! I love the extra touches you made that bring the whole thing together and make it all look custom. Thanks for your great ideas ALL Year. Very beautiful and so easy too! A winning combination! Beautiful, fresh and easy centerpieces! I especially love the lime and citron colors. I bet they smell heavenly! 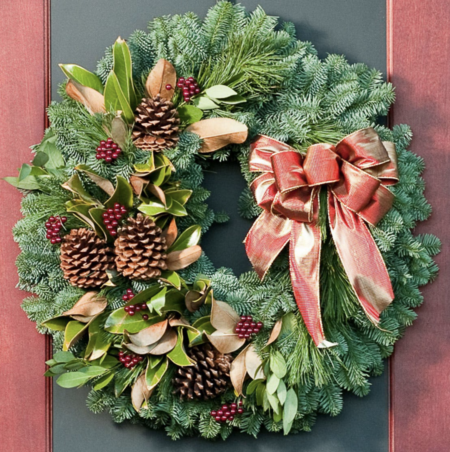 Nothing is more welcoming in the holiday season that the look and smell of fresh greenery – what a lovely wreath! Yvonne I am most thankful for you this year as a new subscriber. You brighten my day and have given me so many decorating ideas. I look forward each posting. Those wreaths are beautiful and I’m sure the smell is awesome too! I’d love to win the wreath! All of these arrangements and wreaths have been just beautiful. I’d love to win one. Thanks so much! 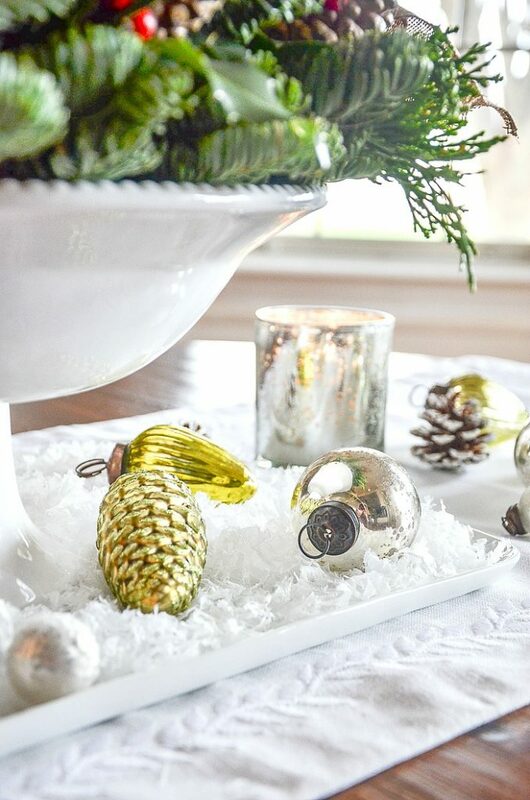 The beautiful pine centerpiece is definitely enhanced by your choices of the bowl, table runner, snow, shiny balls and mercury glass lights! You know, the Yvonne touches! Lovely and EASY. I always come away from my visit to the blog with amazing ideas to use in my home! Thanks for all your inspiration! (Everyone raved about my velvet pumpkin and chinoiserie centerpiece for fall!!!). Now I am inspired to decorate my coffee table! Thanks Yvonne and all your bloggers for sharing! Fresh greens. so beautiful and the scent of Christmas. Thank you, thank you, thank you . The fresh greens look so beautiful and they probably smell wonderful too. Both arrangements are gorgeous Yvonne, thank you for the great ideas. Merry Christmas!!! What a fabulous idea! Love fresh greens anywhere!! The wreath being used as a centerpiece is great! Very nice idea to use prearranged wreathes for a center piece. Simple and quick. Just recently found Lynch Creek Farms. Their items are simple and elegant. Your home is the perfect canvas to showcase their lovely greenery creations. I happily admit that your ideas have encouraged me in Christmas decorating, to use what I have, and embellish with natural elements. Of course, a little glitz and glam and mercury glass are perfect with greenery and pinecones. Thanks for all you share. The centerpieces are very beautiful – and easy! I look forward to your posts and read them daily. I love how creative you are! I’m a good copier. 🙂 You inspire me. The wreaths from Lynch Creek Farm are absolutely beautiful ! Love the centerpieces!! Have a Merry Christmas! Wow! Very beautiful! Thanks for another great idea. Thank you for the great shortcuts by using something already put together. Thanks for the opportunity for the giveaway. Merry Christmas! I love decorating with real greens. The beautiful wreaths add so much elegance to your decor. What a beautiful wreath!! So elegant and gives off such holiday glow!! It isn’t Christmas without fresh greens in the house. They add so much to the beauty of the season. I love using wreaths as centerpieces. By add a tall candle in the middle, guests don’t even realize you started with a wreath. Pretty and pretty easy–love it! I’m not very creative minded, so these suggestions are just wonderful. I can modify with the items I have around or purchase something new. Thank you for showing simple ways to highlight the season! The wreath is gorgeous. Thanks for the chance to enter. Love a bit of ‘real’! The live greens are simple but elegant paired with the candle. All great ideas but especially love the magnolia wreath. Living in the south, magnolia leaves are abundant. Amazing! Such stunning ideas as we always receive from you. I am going to check out Lynch Creek Farm. These wreaths are absolutely a show stopper! I have the perfect spot for one!! Love the weath arrangement! Beautiful! Beautiful wreath! I love the citron green you use. I have used a wreath with a candle holder in the middle several times over the years and it is a quick and easy way to decorate for sure! Thank you for all your inspiring ideas! Yvonne, such wonderful ideas! I love having the scent of fresh greens but don’t want a real tree so this is perfect! Thanks. The wreaths are so beautiful! And such an easy way to decorate! You have some beautiful ideas, thank you for sharing! Merry Christmas to you and your family. Thank you so much for sharing all your amazing decorating ideas. The wreaths are lovely , you can almost smell the pine through the computer. Merry Christmas! Love the wreath! Thank you, Yvonne, for your love of decorating and how you share it with the rest of us. Now, to get as much done as I would like! Your wreath is just beautiful. I have always loved round tables and now have one in my breakfast room. I think a wreath is a perfect center piece. Such an easy idea. I love your blog and all your decorating ideas. You should have your own tv show. The wreath idea is genius. Love the idea of using a wreath for a centerpiece. Can go as small or as large as I have room for. You are so creative. Beautiful; wonderful idea to use the wreath as a centerpiece. The centerpieces you created are just gorgeous. Love them both! Beautiful as usual!! You’re posts are so inspiring. I’m definitely holiday decorating challenged. I have saved so many of your ideas so I remember to copycat them. <3 Thanks for sharing your lovely home with us. Thank you for sharing your beautiful Christmas ideas! Merry Christmas. Love your designs. I use a fall wreath and glass pumpkin for my thanksgiving table. Thank you for this beautiful post. The magnolia leaves in the wreath are lovely. Can’t wait to try these lovely ideas. I love the idea of using a wreath for the centerpiece! So pretty Yvonne! As a Mississippi girl, I love using magnolias for decorating!!! Thank you for the beautiful ideas! I just love this wreath. There is nothing like a real fresh pine wreath! Absolutely loved theses beautiful ideas!! I plan to use them all and I cannot thank you enough for this inspiring post! May you receive many blessing this holiday season! Thank you! Being in the South, I especially love the magnolia leaves in the wreath. So beautiful … and, yet, so easy. Thanks for sharing! You’re ideas are always beautiful, elegant and fun!! All wrapped in one! Thanks for sharing your vast wealth of decorating knowledge with us. Can’t wait to try this in our home. Lynch Creek’s wreaths & greens look so fresh and beautiful and your ideas using them are great! Love the wreath into centerpiece transformation. What beautiful centerpieces. I would love to showcase one on my dining room table. thank you for this post!!!! i was struggling with my coffee table. I cant wait to duplicate this. If i won the wreath it would be wonderful. i just love to read your emails. still wish you could come to boston and make a house call. Happy holidays. 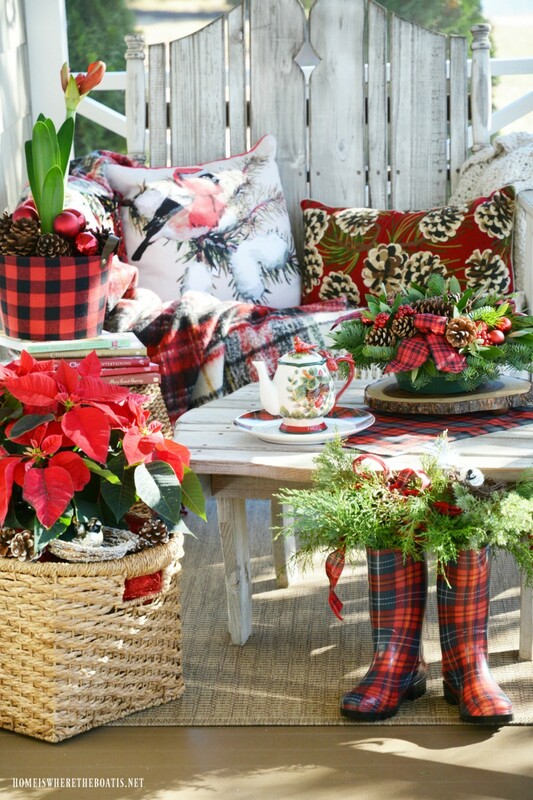 I would love to win that wreath for my sun room coffee table! 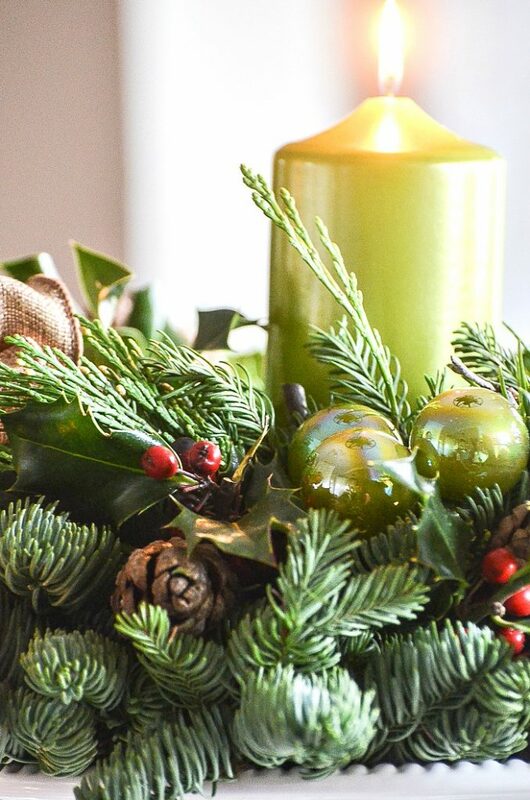 I do use wreaths as centerpieces, but WOW, those with magnolia and lime from Lynch Creek are stunning, Yvonne. I would definitely use something like that in my DR, LR or front door (as it was intended, lol). The table arrangement is just as beautiful. I’m really happy to see you’ve joined this group for floral arrangements. This past year they’ve all had really great ideas. I know you will be a wonderful asset to the group. I love your taste, always classic in style. Oh, Yvonne, I am a southern belle born and raised in the south. This beautiful wreath embodies all of nature as it is in the south. Beautiful greens, sturdy pinecones, and lovely Mongolia leaves. Just beautiful. Love the bow and magnolia leaves with this wreath. Beautiful! Thank you for the beautiful Christmas ideas! Absolutely beautiful – love fresh greens! I too love working with fresh greens. I live in the mountains and cut my own. A beautiful and inexpensive way to decorate. Yours are amazing Yvonne! The magnolia leaf wreath is beautiful! Love both of the centerpiece ideas. I haven’t decorated yet so I am gathering ideas to use this weekend! I use fresh and artificial greens in my home. I love what you did with your arrangement and wreath. These centerpieces are gorgeous! And I love that they are so easy…even I can make them! The Magnolia wreath is stunning. I miss the magnolia tree we had in our front yard when we lived in Tennessee. Don’t see those much up in the Northeast where I am now. Blessings to you! This wreath is beautiful. I love the magnolia leaves that are in with the greens. The bow is beautiful and adds some color. Embellishments are beautiful. I love your blog. I’m an early riser and I read your email as soon as I get up. It is so full of ideas that are practical and even I can do. Thanks for giving of yourself and your time! I also love anything living. Wonderful way to add color and texture to a decoration. Bravo Yvonne!….The centerpiece/arrangement is absolutely gorgeous! I love that Lynch Cree Farm has arrangements that you can also place into your own container if you wish or on as it is comes so fresh in the box upon delivery. Love your snowy theme and and coffee table looks stunning with the wreath on the table as another centerpiece!…So happy to be touring with you this week … Have a very Merry week!!! I never thought about using a bow on a candle wreath. Looks great! Simply beautiful! I love that it is real and I imagine being able to smell the fresh greenery. It would fit perfectly in any Christmas decor! These arrangements are simple yet elegant! The ease in creating them is perfect for this hectic season. Thanks Yvonne! Beautiful wreath! And such good ideas! Merry Christmas!! ? Stunning wreath and the magnolia leaves are a perfect touch! I love Christmas greens and this would be lovely in my house. I love the magnolia blossoms on this wreath.